My entry in the Sunday Selfies blog hop, hosted by The Cat on My Head! Day of the Dead is a Mexican holiday celebrated throughout Mexico and by people of Mexican ancestry. The multi-day holiday (October 31-November 2) focuses on gatherings of family and friends to pray for and remember friends and family members who have died. Traditions connected with the holiday include building private altars, honoring the deceased using sugar skulls, marigolds, and the favorite foods and beverages of the departed, and visiting graves with these as gifts. Colorful Day of the Dead statues can be easily found alongside Halloween decorations on store shelves, and earlier this fall Mommy excitedly came home with a festive cat statue to add to our holiday decor! When I gently reminded her what a pawsome giveaway this would make, she went back to the store and bought another one! To enter, simply fill out the Rafflecopter below! This giveaway is open to everyone worldwide; deadline is midnight Eastern Time, November 6. Good luck! Wow! I LOVE that figurine. Lookin' good, as always, Mudpie! What a cool figurine! Because we have a large Mexican community where we live, we have lots of awesome Day of the Dead items here! My human saw a lot when she was with GJ's humans on Olvera Street. OH MY CAT - THIS IS BRILLIANT! Oh wow, we are getting a Scentsy warmer called Calaca for Christmas, BUT THIS takes our breath away!!!! OK we will not be mean, we will share so all our buddies know because this is paw some!!!! Thank you Mudpie for a gorgeous giveaway!!! No special Halloween plans this year—just giving out candy to the neighborhood kiddos! cuddling up on the sofa and watching scary movies! No plans. Just watching some tv. Pretty statue. We are going to watch some scary movies at home. That is such a cool figurine. I love your selfie too, Mudpie! Very Day of the Dead-ish! Oh, this statue is too cute! I love all Halloween decorations, but those involving kitties and the Day of the Dead are some of my faves. And you are so kind to share this with us! This Halloween will be spent like we always do (and love! ), and that is watching spooky movies while waiting for kiddies to show up at our doorstep. Luckily, the TV and furbaby cuddle station (aka, couch) is a decent distance from the front door, and there are baby gates set up that this mom shuts behind her when trick-or-treaters show up. The baby gate is visible from the front door, though, so the candy-seeking kiddos usually have a few sets of eyes leering at them. I figure that just adds to the spooktacular festivities. Happy Sunday, Mudpie and Melissa! And happy (almost) Halloween! My mum loves that statue and is very happy to see that we can enter to try and win it. 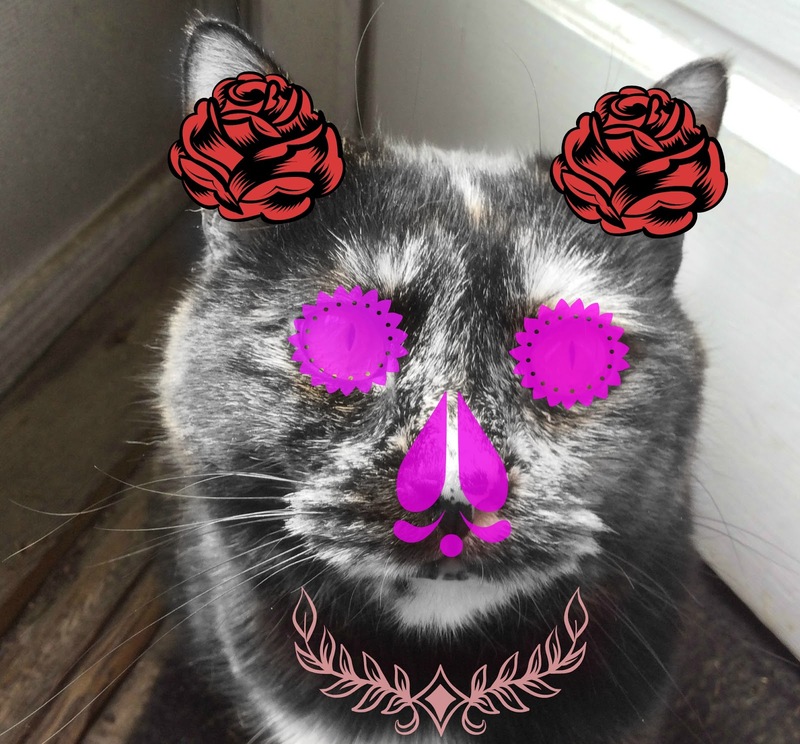 You are looking good decorated for the Day of the Dead for your selfie. We like this kitty statue! We'll be helping the mom hand out candy on Halloween. What a cool find. No Halloween for the cats and I this year, we just moved to a new house, things are still crazy. That is a nice statue, great idea for a giveaway. Your Mom has the most pawsome Halloween stuff!!! We love your selfie!! You look great, Mudpie! And that statue is very cute. We have big plans since it is our favorite holiday. The statue us so pretty and unique we don't have anything like this up North, as in Central Canada! I'm not usually home on Halloween (my daughter and I attend our favorite anime convention - Youmocon in Detroit and it's usually held on Halloween weekend). With Halloween falling on a Monday this year, though, we'll be home. We'll be passing out candy to the trick-or-treaters, but otherwise have no plans. We have bought a couple of costumes for our dogs and cats. My kitten, Kotoha (who I found on July 6th when she was just two weeks old and had to be bottle fed) had spay surgery this past Monday so I have avoided putting any costumes on her. She should be okay to dress up on Monday. We don't dress my older cat, Moko, but my daughter's boy, Arata, has several new costumes, including a Pikachu one. I have to go sit for 3 or 4 hours and have iron treatment then home to chili, a movie, and pass out candy!!!!! Wee luvss yur Hallow'eeny Selfie Mudpie!! An that statue iss BERRY BERRY KEWL!!! Pleeze enter mee name...mee wood LUV to win this fur LadyMum! The cats will get a special treat early on Halloween day and will hide in the basement when the Trick or Treaters come. Thanks for the great statue giveaway! Wow! I LOVE that figurine. Love the cat figurine! Me and Ms. Mouser plan on staying home and giving out candy to the trick or treaters. Our boys are planning on staying warm and safe within our house. They don't care for those noise kids who hammer on the door and yell trick or treat. Romeo and Ralphie also know Mommy and Daddy are happier when they don't have to worry about them getting outside and lost. I adore that day of the dead kitty. What a fabulous giveaway! No special plans for the kitties this year, aside from extra snuggles, of course! What a beautiful figurine! We don't get trick or treaters, so we're having a quiet evening. We probably won't get any trick-or-treaters, unfortunately, but we're going to watch Great Pumpkin. Mudpie, your selfie is adorable! What an awesome statue. We'll cuddle and watch some scary movies. Your selfie is soooo scarey, Mudpie! Happy Halloween! Nope, but we are dressing up our dog. My cats and I don't have any special Halloween plans this year. Wow Mudpie, are you behind that mask somewheres? All was furry quiet around here and in most neighborhoods - Lots of folks turn their lights off. seems like most folks are taking their kids to big events like our Zoo and churches and city sponsored events and our malls vs door to door. Nope, we are going to stay indoors to avoid any nasty tricks!